IN a game enjoying unprecedented popularity and a league full of rising stars, Tina Salak has again proved that age doesn't matter. The evergreen Salak once again proved that she remains one of the best volleybelles in the land at 38 by winning the Most Valuable Player award of the recently concluded Philippine Super Liga All Filipino Conference. The 38-year-old setter was instrumental in Generika-Army’s successful title run that made it the only franchise to win a championship in the first three conferences of the fledgling league - a surprise, really, considering she wasn't even a part of the team at the start of the tournament. Salak, an Army corporal, begged off from the Lady Troopers’ campaign in the All-Filipino Conference as she opted to continue attending military school to bolster her bid for a promotion. But after the Lady Troopers lost their first two games without their setter and acknowledged leader, Army was left with no choice but to beg Salak to go back in active duty. That proved to be the major turning point for Army as the rejuvenated Lady Troopers won their next six games on the way to retaining the championship. 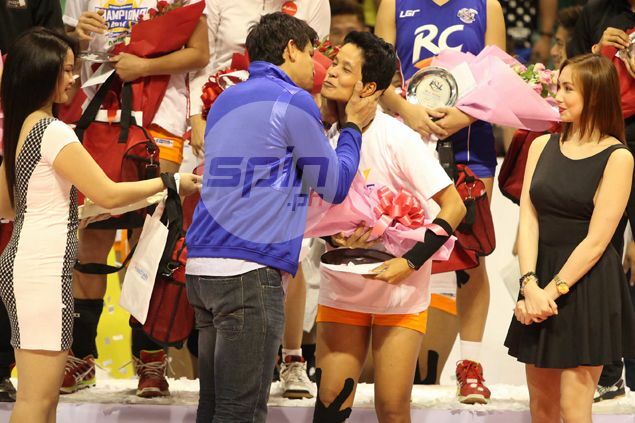 The newly crowned MVP, however, was quick to play down her role in the three-peat. “Hindi naman dahil sa akin 'yun,” she said after the three-set sweep of finals rival RC Cola-Air Force, 25-22, 25-19, 25-16, before a jampacked crowd at the Astrodome on Saturday. “Nakalimot lang sila (teammates) ng leadership sa laro. Kahit naman wala ako kaya naman nila (manalo),” she added. Salak confessed that she was determined to sit out the last tournament, as she wanted to give way to younger counterparts. Health was also an issue. Army coach Rico de Guzman, however, was quick to the draw. He sat down and talk things over with her star player, convincing Salak that her volleyball journey is not yet over. “Sabi ni Tina sa akin dati 'di na niya kaya. Sabi ko naman sa kanya, 'Di pa panahon para bumitaw ka sa paglalaro,'” he said. De Guzman also knew his reliable setter is the missing piece to the puzzle for the Lady Troopers. “Hindi ko naman naisip na matatalo na kami, nasa isip ko si Tina ang sagot sa mga problema ko. Hinahanap ko ang leadership ni Tina,” he said. Despite the success, the thought of retiring from the sport still lingers in Salak's mind. But first, the Lady Troopers need to find a legitimate setter capable of filing the shoes Salak will leave behind. Salak said the team is actually training its sight on outside hitter Jovelyn Gonzaga to assume the position if it fails to convince a civilian standout to enlist. “As of now, wala pa akong kapalit. Pero kung walang makuha si coach na civilian para ma-enlist, surprise pa 'to eh, pero tine-train na namin si Jovy (Gonzaga) as the next setter,” she said. Salak believes the sweet-hitting Gonzaga is capable of assuming the role as the Army star herself began her playing career as a middle blocker. “Time lang 'yan, eh. Nag-start ako as middle blocker, naging utility at ngayon setter. Hindi ka naman magiging magaling kaagad,” added Salak. Following another successful tour of duty with Army in the PSL, Salak said she will return to processing her promotion, which she hopes to finally get this year. On whether Army's court general will wage battle again in the Super Liga remains to be seen.